Brilliant on the turf and a national hero, Brantôme, bred and owned by Edouard de Rothschild, was a natural target for the Nazis when they occupied France in 1940. He spent over four years in exile in Germany, along with virtually all of the Rothschild bloodstock from their famous Haras de Meautry, but when he returned, he got a son whose win in the 1950 Grand Prix de Paris signaled the complete restoration of the Rothschild racing and breeding fortune, and, through him, Brantôme had a profound influence on world-wide thoroughbred breeding. Brantôme was out of Vitamine, by Two Thousand Guineas winner Clarissimus, a son of the good English stayer Radium. Vitamine won four races at ages two and three, including the Prix Jacques le Marois, for Baron Edouard de Rothschild, who had bred her at his famous stud farm, Haras de Meautry. Her dam, the unraced Viridiflora, by the grand Meautry stallion Sans Souci, had been bred by Auguste Aumont in 1912, and later sold to the baron, who at the time was expanding the Meautry broodmare band, mostly with imported English mares, but who was probably happy to secure another Sans Souci daughter for his stud. At Meautry Viridiflora bred five winners, including Viburnum, winner of 13 races, and Verte Feuille, later the dam of the winners Grandiflora and Conway. Viridiflora's dam, Rose Nini (1901, by Le Sancy), had been bred in England and sold to Aumont for 210 guineas, who took her to France, where, in addition to Rose Nini, she produced Rose Verte (by Elf), winner of the 1911 Prix de Diane for Aumont. Unfortunately, Vitamine's female line, unlike many others at Meautry, died out early. Brantôme's sire, Blandford, undefeated in four starts, had his career cut short by a bowed tendon. But he made his reputation at the Cloghran stud, near Dublin in Ireland, and cemented it after he was moved in 1933 --due to the tax structure skewed by disputes between Britain and the Irish Free State -- to the farm of his owner, Richard Dawson, at Whatcombe in Berkshire, England. In 1934 Blandford reached the top of the sires list in Great Britain for the first time by a huge margin, excluding Brantôme's wins in France, propelled to the top by his classic winning son Windsor Lad, by the stayer Felicitation, and by Umidwar, by the juvenile champion Bahram, and other lesser lights. He would lead the list again in 1935 and 1938. Blandford was a stallion favored by Edouard, who, despite owning quality home-bred sires at Meautry, had a system of sending some of the farm's mares each year to Ireland and England to be bred to high class horses. In 1929 Vitamine visited Blandford at Cloghran, and in 1930 dropped a bay colt, Electron, a winner of races at ages 2, 3 and 4, and later sent to Argentina as a stallion. Put to Blandford again, in 1931 she dropped her second foal, Brantôme, foaled in France. Bred to the Meautry stallion La Farina that year, in 1932 she produced Crudité, a fine race mare whose wins included the Grand Prix de Paris. In 1933 and 1934 she was sent to Blandford's Epsom Derby-winning son, Blenheim, who was at stud at the Aga Khan's Haras Marly La Ville in France, producing Chenonceaux (1934) and a filly, Parvati (1935). Chenonceaux was a good juvenile for Edouard, winning the Prix La Flèche over 5-1/2 furlongs at Le Tremblay and third in the Prix Lord Clifden. Parvati bred on, but her branch did not produce significant winners. Brantôme stood about 15.1 hands when grown, and was light-boned, with a somewhat delicate appearance, but he had a wonderful shoulder and straight hind legs, the latter almost unfailingly passed on to his offspring. Some English critics said he looked like a polo pony, and even French turf writers admitted he did not appear to be an athlete...until he was in motion. All noted his fluid, unforced, balanced movement, that made it look like he was barely expending any effort as he came from behind in so many races to win. He was a bit on the "fiery" side temperamentally, which had serious consequences for his turf career at age four. Brantôme was sent to Edouard's trainer, Lucien Robert, at Chantilly, and in June he embarked on a smart, well-spaced out, limited campaign. He made his debut in the five-furlong Prix de Martinvast over five furlongs, winning it by a length and beating six other youngsters. Next up was the six-furlong Prix Robert Papin, where he bested ten runners by two lengths. In August he won the Prix Morny at Deauville (six furlongs), ahead of the rest of the field by 1-1/2 lengths. His final race was the Grand Critérium at Longchamp, the biggest and richest race for juveniles held in October over a mile. He easily won the race by a length, beating all surviving high class two-year-olds. He retired for the season, having won the French juvenile "Triple Crown," already considered something of an unbeaten phenomenon, and was the champion of his year, rated 9 st. 13 lb. in the Free Handicap. At age three Robert put him in a tune-up race, the mile long Prix de Sèvres for three-year-old colts, where he cantered home six lengths ahead of the next colt. Ten days later, starting favorite in the Poule d'Essai des Poulains, he came from behind in a blazing burst of speed to take the race by three lengths, ahead of Admiral Drake, Shining Tor, and three others. Two weeks later was Longchamp's Prix Lupin (10-1/2 furlongs), in an eight horse field that included Astronomer, Shining Tor, Le Grosse, and other good youngsters. Brantome's jockey, Charles Bouillon, held the colt in an easy waiting game, and as the horses passed the stands, just gave him his head. Brantôme turned on his brilliant speed, pasing the post 2-1/2 lengths head of the next colt, Shining Tor. While training for the Prix du Jockey Club, Brantôme developed a cough. He was out of the Derby, won by León Volterra's colt Duplex, that had only won two small races prior to his surprising win, and did not place in any races after that season, with Pons Legend second, and Admiral Drake third. As it turned out, Brantôme's illness kept him from running in the Grand Prix de Paris as well, won by Admiral Drake, with the highly regarded English colt, Easton (second in both the Epsom Derby and Two Thousand Guineas) third. Brantôme did not appear again on the turf until September 16, Rothschild and Robert taking no chances with their champion colt's health. In the Prix Royal-Oak at Longchamp (1 mile - 7 furlongs), running against a good field that included Admiral Drake and Astronmer, he ran wide, losing ground, but when Bouillon let him go, he came up to pass the leader, Astronomer, to win by a neck in a thrilling finish. His next race was the Prix de l'Arc de Triomphe, the richest race in France. The field of thirteen included Admiral Drake and Duplex, the Aga Khan's Ascot Gold Cup winner Felicitation, and the good runner Maravédis. In this race, Bouillon let him go near the Pavilion, and he came up to Felicitation, who was setting the pace, and then appeared to falter, but drawing on his tremendous strength and speed, he gathered himself to stride past Felicitation, and, holding off a late challenge by the Astérus son, Assuérus, passed the finish line 2-1/2 lengths ahead of Assuérus, with Felicitation third. It was a thrilling race, and the crowd went wild, Brantôme and his owner "receiving the greatest popular demonstration ever heard on a French racecourse," not only for the exciting race, but because he had beaten a highly qualified English horse. It was Edouard's first win of the Arc; his good colt Cadum had been first past the finish line in the Arc of 1925, but had been disqualified. Brantôme retired for the season, unbeaten and champion once again. His English-based sire, Blandford, was second on the list of leading sires in France that year, due to his efforts. His popularity was further bolstered by a film short, Brantôme: Invincible Horse, that was shown in French theatres. Brantôme under colors In 1935 Brantôme's races were aimed at preparing him for the famous stayer's race in England, the Ascot Gold Cup. On May 1 he took the 2 mile-3 furlong Prix Edgard Gillois at Le Tremblay, winning over indifferent opponents by 2-1/2 lengths. Eleven days later he won the Prix du Cadran (sometimes called the French Ascot Gold Cup) in record time, over 2-1/2 miles at Longchamp, beating Admiral Drake (placed fifth) that had won the Prix Biennal over the same course a few weeks earlier, and five other horses. His next scheduled race was the Prix de Dangu (2-1/2 miles), but enroute to the course he broke loose from his handler, and took a spin down the paved road he had been crossing, dodging cars, for several furlongs before he was caught up. He lost three shoes and had cut himself. As a precaution, he was given an anti-tetanus shot, and he did not appear to be himself four days later in his training run, some speculating he had a reaction to the vaccination and possibly still shaken from his escapade. The Ascot Gold Cup was looming hard, scheduled 11 days after the Prix de Dangu, and Edouard decided to send Brantôme across the channel anyway, to run the race, a decision hailed as "bold and sportsmanlike." Alas, although he ran up near the leaders in his usual style, he never fired with his typical fluid ground-eating stride, and when Bouillon pulled out the whip, everyone knew the great champion was beat. The race was won by the Foxlaw son, Tiberius, by eight lengths, with Brantôme a poor fifth. It was reported that some stunned French racing fans could not believe the news, and peppered London with telephone calls for confirmation; his loss was likened to the incredulity in England when it was reported their grand unbeaten heroine of the turf, Pretty Polly, was whipped in France by the inferior Presto II in the fall of 1904. Even the English press largely agreed that Brantôme was at least two stones below form; he had easily beaten the horse Denver II, that ran third in the Cup, by 20 lengths in the Prix du Cadran, and that he had finished so far back, rather than, say, second, showed he was not himself in the race. Edouard said after the race, "I realise now, too late, that the mishap which prevented my horse undergoing his scheduled training and gallops had caused him not to be his best. I suppose I should not have sent him over, but I knew that such a wide interest was taken in him and the Gold Cup that I wanted to keep faith with the English public." Still, there were some consolations for the Rothschild stable that year: Edouard's Belfonds filly, Péniche won the Prix de Diane (ahead of Samos). Brantôme's younger half sister, Crudité (La Farina - Vitamine) had taken the Grand Prix de Paris, and the Rothschild colt Bokbul (Blandford-Buanderie) would win the Prix Royal-Oak. Brantôme went back to France and was given time off. On September 22 he ran in the Prix du Prince d'Orange (12 furlongs), easily putting away four other horses. Then he went to Longchamp for his second Prix de l'Arc de Triomphe, but he came in fourth, two lengths behind the winning Brûleur filly, Samos, Edouard's filly Péniche (second), and Marcel Boussac's grand filly Corrida that had been champion juvenile the year before. Excuses were made: it was said when he bore out during the race, he struck a stake marking the course, which affected his going. The Arc was Brantôme's last race, and he retired from the turf still a hero to the French public, ready to begin stud duty at Haras de Meautry in the spring of 1936 at a fee of 45,000 francs. He made five seasons at Meautry before he, Bubbles, the leading sire in France in 1938, and Meautry's champion colt Eclair au Chocolate, along with virtually all of Meautry's broodmares and foals were claimed by the Nazis in August of 1940, along with all Rothschild horses of racing age. By December the stallions--except Eclair au Chocolate (who went to the German state stud at Graditz) -- and breeding stock were off to Altefeld stud in Hesse, which had been the German National Stud and had been annexed by the S.S. and turned into an army stud. The racing stock was sold in a series of auctions in France, the millions of francs made on the sales sequestered by the Germans. Brantôme was most often bred by the German studmaster to Meautry's own mares, and the resulting youngsters ran for the amusement of the German public until racing virtually ceased at the end of the war. It wasn't until the late spring of 1946 that Brantôme and most of the rest were restored to Meautry. Brantôme was not an especially good sire of winners, although he got two that took the Grand Prix de Paris, PENSBURY and VIEUX MANOIR. He did, of course, lose 4-1/2 seasons of normal stud duty by his abduction to Germany and one can't help but wonder what his stolen racing-age youngsters would have done in France under Rothschild ownership, but even so, one can look at the production of the younger Pharis, who suffered the same exile, and see that Brantôme, unlike Pharis, just wasn't what would be called a success as a stallion. But, it takes just one good one to send a sire line forward, and for Brantôme that was VIEUX MANOIR, not only a good runner, but later a successful leading stallion, and Vieux Manoir got two sons that were both leading sires in France, one for three years in succession. 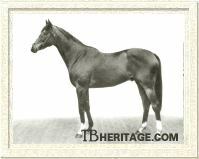 By contrast, Pharis, who had many high-class winners himself, got one son, Pardal, that in his best year, reached second on the leading sires list in Great Britain, and a few grandsons that were leading sires in South America and Japan. Beyond VIEUX MANOIR, Brantôme, whose mates overwhelmingly came from the Meautry broodmare stock, got a number of daughters that bred high class winners at Meautry and were retained at the stud, contributing to its great success as a leading breeder in France throughout the 1950s and '60s. In 1954, two years after Brantôme's death, Meautry had 52 mares in its broodmare band, of which 25 were homebreds: of these, 12 were by Brantôme. 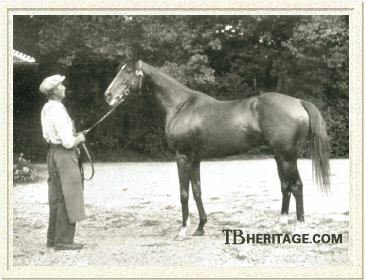 Brantôme was second on the leading sires list in France in 1950, the year of Vieux Manoir's victories; other than that he was never even in the top ten. He made seventh on the list of leading broodmare sires in 1952, fifth in 1953, and was third in 1960. PENSBURY (1940) was Brantôme's first really successful runner in France, although it's hard to assess the quality of the racehorses during the war years, with so many taken off to Germany. He was one of the few good Brantôme offspring not bred at Meautry. His dam was Celerina (by Teddy) that had won the Grand Prix de Deauville and raced in the U.S. before being brought back to France. She was installed as a foundation mare at Haras des Monceaux at Lisieux, owned by Ralph Strassburger, a former American diplomat that inherited a fortune from his Pennsylvania-based father's publishing empire, and settled in France in the 1920s. Some of Strassburger's other horses over the years included 1956 St. Leger winner Cambremer, Grand Critérium winner and later sire Clarion, and Washington D.C. International winner Worden II. PENSBURY, like all of the American Strassburger's horses during the war years, ran in the name of his friend, Mme. de Bonard, and was trained by Jack Cunnington, who was very successful in the early 1940s for various owners. As a juvenile in 1942 PENSBURY won the Critérium at Maisons-Laffitte, but was unplaced in the Grand Critérium at the end of the season. At age three, he and the colt Verso II were the top runners of their generation. Pensbury won the Prix Greffulhe, and was second by a close head to Verso II in the Prix du Jockey Club. In the Grand Prix de Paris, the order was reversed, when Pensbury won the race a half-length ahead of Verso II, with Marsyas third. He did not run in the Prix Royal-Oak, being "reserved" for the Prix de l'Arc de Triomphe, but in the latter race, won by Verso II, he failed badly, running last. There is no record of him as a stallion. In 1942, the same year PENSBURY was making a mark as a flat racer, another Brantôme colt, LUDOVIC LE MORE (1938, out of Farnese, by the Dark Ronald son, Mime) proved to be one of the best horses over jumps, winning both of the most important hurdle races in France, the Grande Course de Haies d'Auteuil and the big hurdle race at Enghein. He had been bred at Meautry, but was no longer owned by the Rothschilds. Not surprisingly, all breeders premiums won by Meautry-bred horses in the war years were sequestered by the Nazi overseers of French racing. Vieux Manoir VIEUX MANOIR was Brantôme's best son in the stud. He was born in 1947, out of Vieille Maison, by Finglas. She descended from Quenouille (by the unbeaten Prestige), winner of the 1919 Prix de Diane for Edouard, that had been purchased as a yearling from Haras du Gazon, the stud of Maurice Ephrussi, a relative by marriage to Edouard. Quenouille became a foundation broodmare at Meautry, and was fifth dam, in tail-female, of Vielle Maison, a winner of the Prix des Lilas and Prix Strathconan, and second in the Prix d'Astarté for Edouard. At Meautry, in addition to Vieux Manoir, Vielle Maison produced a number of other foals, including Bicoque (1944), the dam of five winners, some of which continued as broodmares at Meautry; Vielle Pierre (1951), winner of the Prix Yacowlef and Prix Ridgway, and later dam of Prix de Diane winner Hermiéres; Vielle Demeure, winner of the Prix de la Varenne and Prix de Trouville and second dam of Prix du Jockey Club winner Crystal Palace. VIEUX MANOIR ran five times, winning three races and placing second once. His big win was the Grand Prix de Paris, by four lengths, beating his stablemate Alizier (later winner of the Grand Prix de Deauville and second to Tantième in the Arc de Triomphe), the Pharis son Scratch, and some other good ones, and he also won the Prix de Justicier at Saint Cloud (2500 meters), and the Prix Louqsor, also at Saint Cloud. In the fall he was taken to England, where he ran second to Scratch in the Doncaster St. Leger. His win of the 1950 Grand Prix was a big triumph for Guy de Rothschild and Meautry, particularly since Brantôme's earlier classic winner, PENSBURY, had not run in Rothschild colors. Vieux Manoir did not run at age four, but was syndicated as a stallion. His kind temperament and success as a sire made him a favorite of Guy's. VIEUX MANOIR was champion sire in France in 1958, and third on the list in 1962, and was in the top ten of leading broodmare sires three times. He got two classic winners in France, Val de Loir (1959, from Vali by Sunny Boy), a winner of the Prix du Jockey Club, and San Roman (1955, from Blina by Maravedis), who took the Grand Prix de Paris. His other principal winners were Tang, who won the Prix Jean Prat and P rix d'Harcourt, the stayer Grand Schelem (Prix Kergolay and Prix Rainbow), the good juvenile Mourne (Prix des Chenes, Prix Daphnis, and Prix Yacowlef), Le Haar (Prix Jean Prat), and the good Italian winners Gai Logis (Milan Gold Cup twice, Gran Premio Citta di Napoli and other races), Adoneo (Premio Campobello, Premio Trenno), and Michelozzo (Premio Aldo Ricchi, second Milan Gold Cup). Several of his sons were good stallions, notably Le Haar and Val de Loir. Le Haar was champion sire in France in 1963, due largely to his son, Exbury (1959), European Horse of the Year for Guy Rothschild, with eight wins that included the Prix de l'Arc de Triomphe, England's Coronation Cup, the Prix Daru, and the Grand Prix de Saint Cloud. Exbury, at stud at Meautry, later got Crow, the champion three-year-old colt in England, Zamazaan, champion older stayer in France and later a leading broodmare sire in New Zealand, and the Rothschild's Grand Prix de Paris winner Soleil Noir, among other good runners. Le Haar also got Veronese, the champion three-year-old colt in Italy and later three-times champion sire in that country; Two Thousand Guineas winner Niksar, later sold to Australia as a stallion, and Trictrac, a winner of the Prix Eugène Adam and in New Zealand sire of the champion Balmerino, who took top honors in New Zealand, Australia, and Europe with 21 wins, and later a successful sire in Australia and New Zealand. Le Haar was dam's sire of the brilliant champion filly in Europe Pawaneese and the champion three-year-old colt in the U.S., Wajima, among other good ones. Val de Loir, a ridgling, led the sires list in France from 1973 through 1975, and was also twice leading broodmare sires there. His best offspring included the Grand Prix de Paris winner Chaparral, Champion French three-year-old Val de l'Orne, Champion French filly Comtesse de Loir, Irish Oaks and Prix Vermeille winner Lagunette, English Oaks winner La Lagune, and Gran Premio di Milano and Prix Hocquart winner Beauregency. Val de Loir was broodmare sire of the European champion Shergar, the classic winner and sire Green Dancer, and the English champion filly Sun Princess, among may other winners. VIEUX MANOIR's son Mourne also became a useful stallion in France; among his offspring were Snob (1959), a winner of the Prix de la Forêt and a champion sire and champion broodmare sire in France. Mourne was later exported to Japan, where he was a good sire. VIEUX MANOIR became infertile by the age of sixteen, and he lived the life of a pensioner until the age of 30. Dragon Blanc DRAGON BLANC (1950), French juvenile champion of 1952, was out of La Dame Blanche (1943-1953, by Biribi), a mare from the Justicia (sometimes Reine Mab) family established at Haras de Meautry in the 1890s; Dragon Blanc was bred 4 x 5 to the Meautry stallion Sans Souci. La Dame Blanche's dam, Nymphe Dicté (1935, by Diolite), was a stellar broodmare at Meautry that had won the Prix Trocadéro and was second behind Canot in the Critérium de Saint-Cloud and at age three won the Prix des Etangs (1800 meters) when the winner was disqualified, and was second in the Grand Prix de Nice and placed in some other races. Nymphe Dicté, like most of the mares at Meautry, was taken to Germany in 1940, and La Dame Blanche was born there; both were retrieved by the Rothschilds at the end of the war, but it was too late to race La Dame Blanche and she went into the broodmare band. La Dame Blanche's first winner, conceived in Germany, but born in France, was the appopriately named L'Exile (by Weber), a winner of four races. After DRAGON BLANC she bred Alba Nox (by Coaraze), a winner, who at Meautry bred some daughters and the Grand Prix de Paris winner White Label (1961, by Tanerko). DRAGON BLANC ran four times at age two. He easily won his first small race, then was second in the Prix Robert Papin to Pharel, and running into traffic in the Prix Morny, could not make up the lost ground finishing third. But in October he won the 1600 meter Grand Critérium, the big juvenile race in France, by six decisive lengths, securing him the top honors for the year. Before his second season could begin, he injured himself sufficiently to terminate his career. He was sold as a stallion to Brazil. Brantôme's other winning sons included ABBE PIERRE (1937, out of Suze by Filibert de Savoie), a winner of minor races in England, and, sold to the U.S., a winner of three races in 1942, and of the Puritan and Bunker Hill handicaps in Massachusetts in 1943; BRUEGHEL (1939, Buchanite - Son-in-Law), seized and sold by the Nazis, was a good runner, winning the Prix des Reves d'Or and the Grand Prix de la Ville de Nice, and placed third in the Prix de l'Arc de Triomphe to Djebel and Tornado. The front-running COQUELIN (1950, out of Bicoque, descended from Quenouille in tail-female and so the same family as VIEUX MANOIR) was a good juvenile and at age three won the Prix Maurice de Nieuil at Saint Cloud over 2500 meters, and was second by a length to Buisson d'Or in the Prix Royal-Oak and second in the Grand Prix du Printemps, and in England, third in the Jockey Club Stakes. 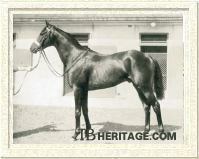 CALDARIUM (1939), was out of the good Massine daughter Chaudiere, that had won the Grand Prix de Lyon, Prix Marechaux and Prix du Cadran for Edouard Rothschild; her family at Meautry went back to the Le Sancy daughter Zingara (1901) that had bred the good runner Sans le Sou and Zagreus at Meautry (both by Sans Souci). He was another colt of racing age seized and auctioned by the Nazis; he was put to steeplechasing, and won the Prix d'Auteuil, the Grand Steeplechase du Printemps, the Prix du Président de la République steeplechase, and was second to Boum in the Grand Steeple-Chase de Paris in 1945. Returned to Meautry after the war, he was later the sire of Antony, a winner of the Grand Critérium at Milan in 1956, of the good jumper Frascati (winner of the Grande Course de Haies d'Auteuil), and of Hidalgo (Prix Henry Delamarre), Launay (Prix Jean Prat), Trac (Prix Eugène Adam), Calta (Grand Prix de Marseille) and Caldova (Grand Prix de Bordeaux). CALDARIUM'S son Romantisme (1950, out of Rhodogune by Assuérus), bred by Maurice Benoist, was an incredibly versatile and long-running winner on the flat and over fences: he won 15 flat races in 45 starts, and 16 races over fences in 24 starts through age nine, including La Coupe at Longchamp (3000 meters), the Grand Prix de la Ville de Vichy (2600 meters), the Grande Course de Haies de Printemps, the Grande Course de Haies d'Auteuil, the Prix Kergolay, and many other important races on the flat and over jumps. CALDARIUM also got a sister to Hidalgo, Folie Douce (1949, winner of three minor races), the dam of Prix Vermeille winner Mi Carina, of Mother Goose (second in the Epsom Oaks), and of Peroxide Blonde (sent to the U.S., dam of Belmont Stakes winner Stage Door Johnny), and in the U.S. of Sweet Folly, winner of the Ladies Handicap. In Germany Bratôme bred a number of winners of races, including seven in 1943 and '44, in addition to five horses of racing age seized in France and winning in Germany in 1942. Among these was REINE SHUB AD (1939), a Meautry filly of racing age taken to Germany, where she won three races and then bred in Germany, producing a foal that later could not be traced. Restored to Meautry in 1946, she bred four winners. 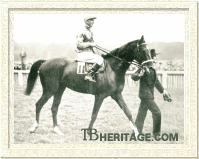 One good Brantôme son, TRIBOULET (1939, out of Mignonette, by Phalaris), bred at Meautry had been sold to the Austrian National stud at Murhof; he was appropriated by the Nazis, and taken to Germany. He did well enough in Germany at age three, placing third to Janus and Ladro in the last running of the Fürstenberg Rennen, held that year at the Hoppegarten, rather than Baden-Baden, and not renewed until 1952. He was also second to Tartaglia in the Langer Hamburger Ausgleich at the Hoppegarten. Repatriated to Murhof from the British zone in Germany, in 1946 he was the champion runner in Austria, which was undergoing painful attempts to re-establish racing in the country, where the historic Viennese racecourse Freudenau had been totally demolished by bombs. He won "most of the chief races" in the second half of the racing season after he was returned in the summer, including the Jubilee Prize (beating the Austrian Derby winner Bok by eight lengths over 12 furlongs), the Austria Prize (6-1/2 furlongs), the Ludwig Urban Memorial (1 mile), and three other races. He was then retired to stud at Murhof, but in the post-war years the national stud never regained its former success, and its stallions were overshadowed by imported stallions in private studs that were established after the war. Another Brantôme foal born at Altefeld in Germany was the filly KIRSCHFLIEGE, out of the Papyrus mare Curl Paper, that had been taken from Meautry. A small filly, she was not judged of sufficient quality to return to France and was part of the left-over stock at Altefeld that was purchased by a Mr. Schindling after the war. That was a mistake for France, because she got two really good sons at Schindling's Gestüt Asta. Kaliber (1951, by Wiberwind) won the Carl V. Weinberg-Pokal at Frankfurt as a juvenile, and at age three took the Österreichisches Derby (Austrian Derby), beating Tornado, and then in Germany won the Deutsches Derby (German Derby) and other races to 1956. Kilometer (1953, by the Meautry stallion Alizier) won the Henckel-Rennen and the Union-Rennen, and the Deutsches Derby at age three. Kilometer was later a good sire in Germany whose offspring included Brisanz, winner of the German equivalent of the One Thousand Guineas and the Oaks. Brantôme was far better as a sire of good broodmares than as a winner-getter. His German grandsons, both winners of the Deutsches Derby, have been mentioned. In the U.S. a daughter produced Kentucky Derby winner Tomy Lee. In France, his daughters produced several classic winners and sons that became good stallions. One of his best daughters was the Edouard's MONTAGNANA (1937 out of the purchased mare Mauretania, by Tetratema), who was another racing-age Brantôme offspring taken to Germany after she had won for Edouard as a juvenile in France, where she took several races. Restored to Meautry in 1946, with a foal by Cranach (also stolen from Meautry) at her side, named Violoncelle, she later produced some of Meautry's best products in the 1940s and early '50s: Ocarina, Guersant, and Flute Enchantée. Violoncelle was a good juvenile, and it was hoped he would be the living emblem of the Rothschild post-war resurgence in the classics. He could only run third in the 1949 Prix du Jockey Club, which Edouard, ill and near death, had been brought to Chantilly to view. The baron died a few days later. Violoncelle however, went on to win the Grand Prix de Saint-Cloud, the Coupe de Maisons-Laffitte, the Prix d'Harcourt, and the Prix du Conseil Municipal. MONTAGNANA's 1947 foal, Ocarina (1947, by the Meautry stallion Bubbles) was another good one, unbeaten in four starts at ages three and four, winning the Grand Prix de St. Cloud in record time. He was later a useful stallion at Meautry. Her 1949 foal was Guersant (by Bubbles), an outstanding miler that twice broke the eight-furlong record at Longchamp, won the Poule d'Essai des Poulains and Prix de la Forêt, the Prix Ganay, the Prix des Sablons, and in England, Ascot's Hardwicke Stakes (1-1/4 miles) and the Sandown Park Coronation Stakes (1-1/4 miles). MONTAGNANA's fourth foal was Flute Enchantée (1950, sister to Violoncelle). She was unlucky not to win the Prix de Diane, and in the Grand Prix de Paris gave a terrific run from behind to place second. She won the Grand Prix de Deauville easily, but broke down soon thereafter. Flute Enchantée remained at Meautry as a broodmare, where her daughter, Cremone (1956, by Blue Peter) likewise became a broodmare and was tail-female ancestress of some good winners. Flute Enchantée also produced Prix Noailles winner Premier Violon (1963, by Klarion), and Prix Lupin and Prix Noailles winner Luthier (1965, by Klarion), both bred at Meautry; Luthier was champion sire four times in France. 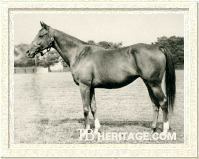 FRENCH KIN (1938, out of Keener, by Coronach), was the dam of Mitrailleuse, winner of England's Park Hill Stakes. Mitarilleuse later bred Rally, a winner of the Queen Alexandra Stakes, and some good daughters at Meautry, including the second dam of 1969 One Thousand Guineas winner Full Dress, and the dam of Doncaster St. Leger winner Commanche Run (1981, by Run the Gantlet). REIN SHUB AD (1939, from an old Meautry line tracing back to the Le Sancy mare Justicia in the early 20th century), who had also been annexed to Germany where she won three races, was also restored to Meautry in 1946. She produced Reine Martiale (1953, by Court Martial) that won the Prix du Bois and had some good placings, and later produced Prix Robert Papin winner Reine du Chant (1970). Another REIN SHUB AD daughter was Lucky Shoe (1954, by U.S. stallion Pot O'Luck); sold as a juvenile to Guy de Mola, her best race was a second in the 3,000 meter handicap Prix de la Goutte d'Or at Longchamp. She later produced A Tempo (1963), a good winner of the Prix de Code and Prix Edmond Blanc, and placed in some high class races. SCOTCH MIST (1940) was out of London Fog (1922, by Sunstar - Pretty Dark), that had been purchased by Edouard in England. At Meautry she bred Pas de Calais (1946, by Cranach, conceived in Germany), winner of the Grand Prix de Marseille, and Marly Knowe (1950, by Téléférique), who took the Prix Grefulhe and the Prix de la Cote Normande, and finished third in the Prix du Jockey Club. AURORE BOREALE (1941, out of Voutre Celeste, by Legatee) was a tail-female descendant of Captivating Stella, a mare purchased to Meautry in 1921. She was conceived at Meautry, but her pregnant dam, Voutre Celeste, a winner of the Prix Rieussec, was hauled off to Germany where she dropped Aurore Boreale. They were both restored to Meautry in 1946, where Voutre Celeste dropped her colt by Cranach that had been bred in Germany: Ciel Etoilé, later winner of the Prix Royal Oak and the Prix du Cadran. AURORE BOREALE bred Le Geographe (1951, winner of the Grand Critérium, injured and could not run again until the fall of this three-year-old season), Tropique (1952, by Fountenay, winner of the Prix d'Harcourt and in England of the Coronation Cup and Eclipse Stakes), and L'Astrologue (1954, Prix Robert Papin). Her daughter, Aurore Polaire (1955, by Alizier) later produced Soleil (1969, by Major Portion), a winner of the Grand Critérium and the Poule d'Essai des Poulains, among other races, and his half-sister Fidra (1961, by Sicambre) was the dam of good winners and second dam of the Rothschild's 1979 Grand Prix de Paris winner Soleil Noir. OMPHALE (1948), another descendant of Justicia, ran only at age three, winning the Prix Godolphin, a 2800 meter race at Tremblay, and placing in three of her five other races. At Meautry she eight winners, including the grand stayer and weight-carrier Celadon (1959, by Krakatao), who took the Prix Berteux, Prix Jean Prat, Prix Rainbow and Prix de Barbeville at Longchamp, and won the Prix Kergorlay twice, and Marella (1957, by Alizier), winner of the Prix Critérium de Saint-Cloud. BRIEF CANDLE (1950, out of Lady Macbeth, that had been born in Germany, by Téléférique) was another member of the Justicia family. She won a race over 2800 meters at Saint Cloud, and another over 2600 meters at Deauville. In the stud, she bred three modest runners and then produced Timandra (1957, by Court Martial), the champion French filly of 1960, winner of the Prix de Chaville and the Prix Penelope at Longchamp, the Poule d'Essai des Pouliches, and the Prix de Diane. Auld Alliance AULD ALLIANCE (1948, from Iona by Hyperion, a half-sister to Epsom Derby winner Ocean Swell), was bred in Great Britain, won one race, and was a broodmare in the Hadrian Stud of Major H.D.H. Wills. In 1958 she was purchased by the British Bloodstock Agency at Tattersalls December for 11,000 guineas on behalf of American E.H. Augustus, even though she was not in foal. Ultimately, she proved to be a good purchase for the U.S., since she became the third dam of the grand racemare Genuine Risk (1977), winner of the Kentucky Derby, the Ruffian Handicap, and other races. But the reason Augustus directed that she be purchased was because her son, Tomy Lee (1956, by Tudor Minstrel) had already reached America and had become a juvenile racing sensation. In 1957 Texas oilman Frank Turner directed a Dublin bloodstock agent, Bert Kerr, to purchase a weanling half-brother to Irish Guineas winner Tulyar, which he duly got for $25,000 in a private purchase. Once the youngster was secured, Turner told Kerr to obtain Auld Alliance's yearling colt at the Newmarket December sales as a travelling companion for the younger colt, his main attraction his inbreeding to Hyperion. Authorized to spend up to $12,000 for the colt, Kerr purchased him for half that amount, and both colts were shipped by air to California for training with Frank Childs. The Tulyar colt, named Tuleg, hurt his shoulder and never did anything, but the Auld Alliance colt, which Turner named Tomy Lee, showed incredible speed and the wonderful fluent action of his grandsire Brantôme in a trial in January of 1958. Starting in May, he won five races in a row, and was then shipped east, where in Belmont Park's Champage Stakes he bolted, crashed into Intentionally, and then got up to finish a neck behind First Landing; he was sent back to third place for his error with Intentionally. Two weeks later he ran wide in the Garden State Stakes at New Jersey, and was beaten by a head by First Landing. Having popped a splint during the running, he was retired for the year and sent back to California. And in December, his dam, AULD ALLIANCE, was purchased to the U.S. The next year Tomy Lee was second twice in California, before being sent to Kentucky, where he won a 7 furlong race at Keeneland, and then a tough battle in the Blue Grass Stakes. He went on to the Kentucky Derby, and beat Sword Dancer in a punishing race with a lot of bumping. He went home to California, where, in the Cinema Handicap, ridden by a jockey unfamiliar with his antics, rather than his regular rider, Willie Shoemaker, he bore out, slamming into Ole Fols, and finishing well down the field in sixth place. He didn't race again until December, when he easily won the Alhambra Purse. In 1960, carrying 127 pounds, he was misused by his jockey in an early battle and ran fourth in the San Carlos Handicap; in the Maturity Stakes, carrying top weight, he went to the front, ran out of steam, and finished seventh. Turner retired him and sent him to Lexington for stud duty at the Stallion Station, but he was not a successful sire. Brantôme was a terrific racehorse, certainly the best ever bred at Haras de Meautry, and he managed to get one good son that continued his sire line with two great sire sons of his own that had a significant impact on European breeding and in Australasia. Many of his daughters produced high class runners, and a number of them bred on. Suffering from kidney trouble in the early summer of 1952, Brantôme was humanely put down on July 2. The French headlines read "Brantôme de Rothschild is Dead," linking the great stallion with the family he had so long been part of, and who left them a long-lasting legacy.